Hola, ¿Cómo estáis?. Hoy vengo a daros a conocer una web que he conocido gracias a que han contactado conmigo. Se trata de la página Check Pregnancy. En ella se resuelven numerosas dudas acerca de la salud de la mujer, sobre todo sobre higiene íntima femenina y asuntos relacionados con el embarazo y con los bebés. Eso sí, para el público de habla hispana el problema es que es una web escrita en inglés, pero nada que no pueda resolverse con google translator. La página se divide en varios apartados. En concreto, uno sobre temas de fertilidad con números artículos muy útiles al respecto. Otro de ellos es el de cuidados a tener en cuenta durante el embarazo. Así por ejemplo, he descubierto que comer azafrán tiene numerosos beneficios para la salud pero que hay que tener en cuenta algunos aspectos antes de consumirlo estando embarazada. También es interesante el que se llama test de embarazo que tiene artículos como cuales son los test de embarazos que se consideran mejores o información sobre qué días son los mejores para utilizar dicho test. Además, se pueden encontrar otros textos con variados consejos. Por ejemplo, sobre cómo elegir la mejor bolsa para pañales. Uno de los artículos más populares es el de ‘7 señales de si vas a tener un bebé niño o niña’ o el de ‘Lo que toda madre necesita saber sobre el pulso alto durante el embarazo’. En esta web también se pueden plantear consultas mediante un formulario. En definitiva, creo que es bastante útil disponer de páginas web de este tipo, más aún en el momento del embarazo pues, al menos yo, tuve mil y una dudas y a veces viene muy bien poder consultar en Internet para tener una respuesta. Eso sí, una buena respuesta como las que se pueden encontrar en esta página, porque en Internet ya sabéis que no todas las informaciones son correctas. Por todo ello, os recomiendo echarle un vistazo. Hello, How are you? Today I come to show you a nice web that I have known these days. This is the Check Pregnancy page. In this web they solve so many doubts about the health of women, specially about female intimate hygiene and issues related to pregnancy and babies. Of course, for the Spanish speaking public the problem is that it's a web written in English, but nothing that can not be solved with google translator or with a good level of English. The page is divided into several sections. Specifically, one on fertility issues with very helpful articles. Another of them is the care to take into account during pregnancy. So for example, I have discovered that eating saffron has numerous health benefits but you have to consider some aspects before consuming it when you are pregnant. Also interesting is what in the web is called pregnancy test, in that section there is articles such as which are the pregnancy tests that are considered better or information on which days are best to use the test. In addition, you can find other texts with various tips. For example, on how to choose the best backpack diaper bags. 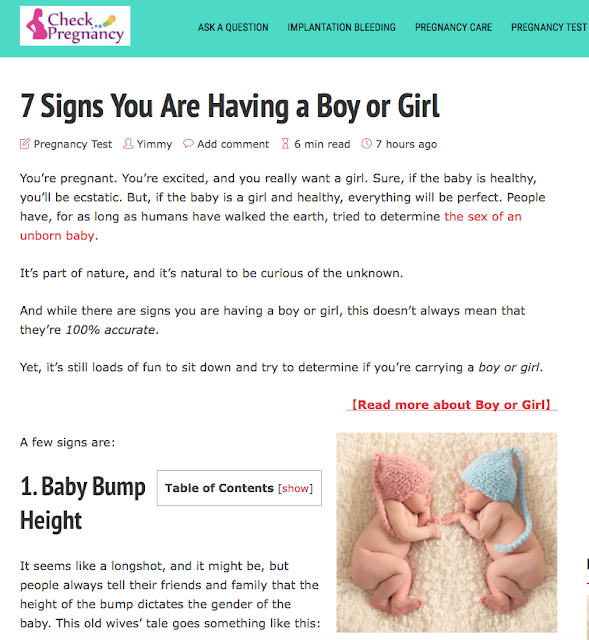 One of the most popular articles is '7 signs of whether you are going to have a baby boy or girl' or 'What every mother needs to know about high pulse during pregnancy'. In this web you can also ask questions through a form. In short, I think it's quite useful web and you have to consult it, even more at the time of pregnancy because, at least I had a thousand and one doubts and sometimes it is very good to consult the Internet to have an answer. That yes, a good answer like those that can be found on this page, because on the Internet you know that not all information is correct. For all this, I recommend you take a look of Check Pregnancy.